It's good to be back! Let's get things back on the right track with the GR-75 and the final ship of Wave III. Spoiled almost 2 months ago at the start of May, the GR-75 looks to seriously shake up the Rebel meta, adding some incredibly inexpensive ships to the faction that already had the cheapest cost activation previously. 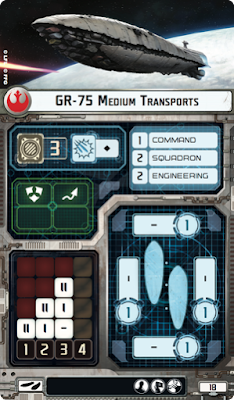 The GR-75 is notable for being the second of two "Flotilla" ships in the Wave III release, meaning that it shares with the Gozanti the new overlapping rules. No suicide ramming with this guy. 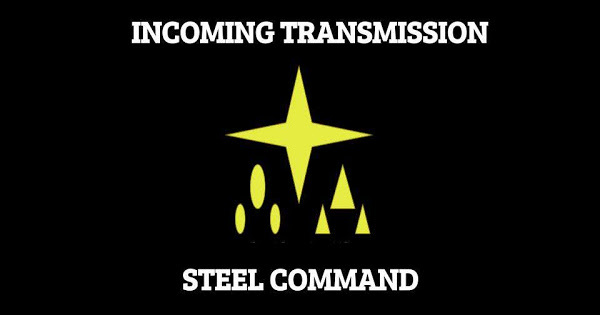 Of the big three values, Command is a low 1, giving it quick response to changing situations as you would expect from a small, inexpensive ship. Squadron is a respectable 2, giving it the best point-for-point squadron activation in the game, especially with the lower cost variant. Engineering is also at 2, meaning it won't be fixing anything without some upgrade shenanigans. For defense, like the Gozanti, it is a single shield on all zones plus 3 points of hull. A single Evade and Scatter token make it1 slightly more survivable. As with the Gozanti, either accuracy or concentrated firepower will take one down without any trouble. Unlike the Gozanti though, the ship is nimble. 2 yaw at Speed 1, 2 / 1 at Speed 2, and 2 / 1 / 0 at Speed 3 means that the ship can nimbly turn with the best ships the Rebellion has to offer. For offense, the basic version comes without any anti-ship weaponry, and a single die for anti-squadron, while the Combat Refit comes with just front and aft getting a single die. This won't be winning any gun battles. This ship also contains a Fleet Support upgrade slot, as well as Officer and Offensive Retrofits standard. The baseline ship is the cheapest in the game, at a mere 18 points total. With a single Black for anti-squadron and no anti-ship battery from any direction, it is definitely meant for a supporting role. 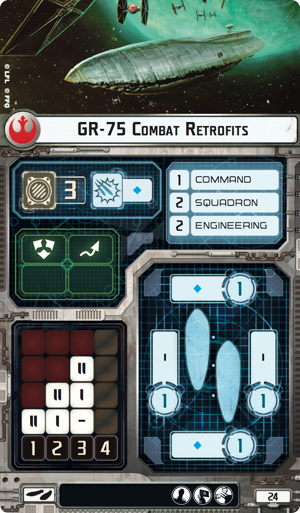 At 24 points, the Combat Retrofit gives just a bit of punch to the GR-75, adding a single Blue die to the front and rear, and upgrading the anti-squadron fire to a single Blue as well. No side die means no Ackbar shenanigans, so sorry anyone hoping for a surprise broadside. Aside from Ackbar shenanigans, the GR-75 Transport is a fine lifeboat for any of your commanders. Rieekan is the most interesting by far, as while you aren't able to use them to ram an enemy, he does turn your Transports into a very inexpensive blocking unit. Put two on the flank of your formation, and your opponent not only has to get through them, but has to waste a turn to get into Black range of your big guns. Mon Mothma improves the Evade in much the same way that she improves everyone's Evade. Not much to discuss there. Dodonna does... nothing really. Garm only donates a single token. General Cracken is another defensive option that can work with the ship, giving obstruction if you are going speed 3 or greater. Bright Hope is a fair options for subtracting damage straight up that would otherwise damage your ship - combined with either Mothma or Cracken it could make your Transport much more difficult to pin down for a negligible point cost (2). Quantum Storm for a singe point lets you really ramp up your speed by functioning as a sort of Engine Tech title, boosting you forward at speed 1 after finishing a maneuver. Good for getting into just the right spot for some support related shenanigans. The most obvious ones for the GR-75 are Leia and Toryn Farr. Lando may be of some extra insurance on a Commander Life Boat, and Raymus Antilles could be used for token swapping with Comm Relays. Adar Tallon is expensive, but could work for squadron support. These upgrades will definitely be talked about in a later article. Again, as with the Gozanti, the most obvious are either Expanded Hangers or Boosted Comms, each one making your squadron activations better. Tractor Beams can combine with Slicer Tools to keep a ship anchored in place, but that is an expensive buy for a trick like that. Anti-squadron upgrades could find a place here, maybe. I think this might be the most obvious role for the ship. 2 squadrons activated at a base, and as many as 4 with expanded hangers and a token. 30 points for a dedicated carrier - Expanded Hangers / Raymus Antilles. Not too bad. Obvious with Rieekan - park 18 points in front of your Black dice slinging foes and keep them at arms length. You can use this with any commander, just less effectively. Run Ackbar for the hills, while his Assault Frigates do the dirty work. Anti-squadron works even if you don't have any regular battery fire. Puke a single black at everything around you. Puke a blue and reroll crits with combat retrofit and Point Defense Reroutes. Jamming Field to keep your fighters alive. Mothmonition coming up for a double tap? Delay for your Last / First with a lot of 18 point fluff! Long story short it is really good to be back! Also worth adding, that a flotilla can be used to get ahead of your own ship and block it. Your flotilla takes the bump but not your ship. I will admit that I hadn't thought of that. Something to keep in mind as a strategy going forward.